ANAHEIM, CA--(Marketwired - Mar 18, 2014) - It's finally here -- the Model Grand Opening of The Domain and doing what you love where you live is about to become your reality. Join Brookfield Residential this Saturday, March 22nd from 10 a.m. to 4 p.m. for the highly anticipated unveiling of The Domain's stylish townhomes and single-level flats conveniently located across the street at the Anaheim Packing District. Invite your family and friends and spend a fun-filled day touring The Domain's five model homes, while enjoying delicious treats from Gypsy Den and Center Street Cheese Shop, plus opportunity drawings to Remedy Hair Shoppe and BARBEER SHOP. Refreshments and entertainment throughout the day from some of the area's hotspots will give you a taste of what it will be like to live at The Domain and a taste is all you'll need to realize you never want to leave. This is your opportunity to put homeownership in its place, right in the heart of the NEW Anaheim. "Now selling, The Domain is already Orange County's most exciting urban new home community," said Mercedes Meserve, Senior Marketing Director for Brookfield Residential Southern California. "The response has been tremendous as today's homebuyers recognize the many advantages of being walking-close to their favorite hangouts for music, cocktails, and dining just across the street at the Anaheim Packing District. Not to mention the amazing amenities right in their own community that include private, resort-style recreation with a sparkling swimming pool, outdoor fireplaces, barbecues, cozy gathering spaces and The Domain's rooftop terrace -- the coolest place to lounge in town. When your most difficult choice on a Saturday night is whether to walk across the street to the Anaheim Brewery or Umami Burger to meet friends or invite them to join you on the rooftop for cocktails and fireworks, you know life is good!" The Domain's innovative floorplans offer intelligently designed townhomes and single-level flats with 1 to 3 bedrooms and 1 to 2 baths in approximately 746 to 1,644 square feet. Distinctive architecture catches the eye, while the homes' technologically advanced features offer a modern edge today's buyers are looking for. The privacy of gated motor courts and private garages with elevator access further enhance the convenience of living at The Domain. With prices starting from the $350,000s, no Mello-Roos fees and a low tax rate, buyers have been ecstatic by The Domain's affordability for such well-designed, perfectly located residences. Anyone who is eager to own at The Domain is encouraged to join the community's Model Grand Opening celebration and take advantage of early phase opportunities. The Domain offers a rare opportunity to live where you want, how you want. To stay where you play and to adore what's inside your door. Not to mention outside your door! Here, a fun, fit, foodie life awaits. Kick off the day with yoga, enjoy a tasty Sunday brunch, and stroll the Shops at Anaheim Garden Walk, The MUZEO Museum and Center Street Promenade, and Farmers Park, an urban focal point where outdoor dining spaces and fireplaces, and even an amphitheater further the lifestyle potential. Homeowners at The Doman can step out their front door to experience this authentic urban lifestyle in the heart of a dynamic, revitalized city. Where else can you walk across the street and have your choice of a whole world of cuisine, coming soon to the Packing House's food hall. Similar in style to public markets found in San Francisco's famed Ferry Building and Seattle's Pike's Market, this 42,000-square-foot building will be filled with a variety of artisan eateries and international offerings. For more information, visit www.Anaheimpackingdistrict.com. It gets even better with all the nearby amenities that create further opportunities for relaxation, enjoyment, and entertainment. Some of the country's major sporting and amusement venues that include Anaheim Ice, The Grove, Honda Center, Angel Stadium and Disneyland are just a short drive away, giving residents of The Domain even more exciting options for a day or evening out. Three freeways are also nearby and the train station is approximately 3.21 miles from the neighborhood, making The Domain a convenient hub for commuting or even day trips. 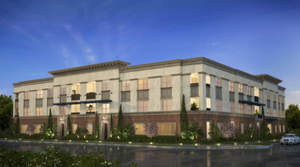 To visit The Domain during its Model Grand Opening celebration from the 5 Freeway, exit Lincoln Avenue and head east. Turn right on Anaheim Blvd, and The Domain will be on your right. From the 57 Freeway, exit Lincoln Boulevard and head west. Turn left onto Anaheim Boulevard. The Domain will be on your right. The Sales Office and Models Homes are open daily from 10 a.m. to 5 p.m. For more details, please call 888.413.2177. Brookfield Residential Properties Inc. is a leading North American land developer and homebuilder with operations in eleven major markets. We entitle and develop land to create master-planned communities and build and sell lots to third-party builders, as well as to our own homebuilding division. We also participate in selected, strategic real estate opportunities, including infill projects, mixed-use developments, infrastructure projects, and joint ventures. Brookfield Residential is listed on the NYSE and TSX under the symbol BRP. For more information, visit BrookfieldRP.com. This Saturday, March 22nd, Brookfield Residential celebrates the model grand opening of The Domain.